Long Zheng has just spotted that Microsoft is already starting to advertise Internet Explorer 9 Beta ahead of its official launch next Wednesday. The banner advert was spotted on TechCrunch and it’s likely to be found on many other sites across the web. The advert features a few quotes from people and web sites that who played with previous versions of Internet Explorer 9. 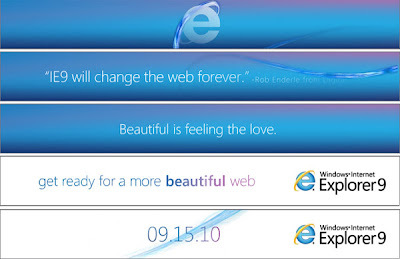 The advert focuses on how Internet Explorer 9 will allow for a different kind of internet than the one we are used too telling readers to “get ready for a more beautiful web”. 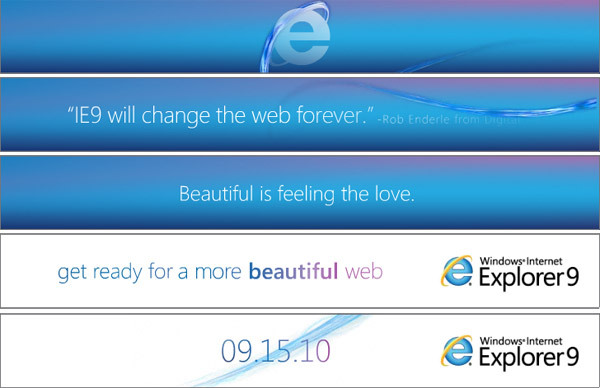 This has been the tag line used with Internet Explorer 9 ever since Microsoft announced they would be holding a special event for the launch of the beta. Microsoft announced back in August that they would be holding an event in San Francisco on September 15th where Internet Explorer 9 Beta would be announced. It is unusual for a company to put so much emphasis on a beta version of a piece of software which suggests either Microsoft have got a lot planned for Internet Explorer 9 or have more to announce than just a browser. An image leaked in late August that is rumored to be of Internet Explorer 9 but there have been many who have questioned the image’s authenticity. 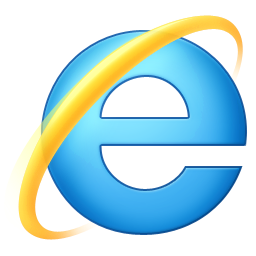 Microsoft has been providing developer access to the much improved Internet Explorer 9 rendering engine on a regular basis. The company has been stressing that developers shouldn’t have to worry about which browser will be rendering a web page but should be able to just write code for all browsers. To that end Internet Explorer 9 will be far more standards compliant than any other Microsoft browser to date and appears to far faster than any previous versions of the browser, its now almost as fast as Google Chrome and Apple Safari.